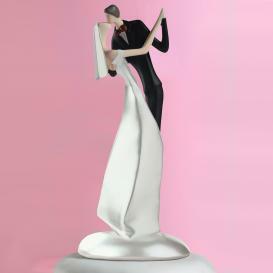 Visit HerWeddingShop for a wide selection of wedding cake toppers. 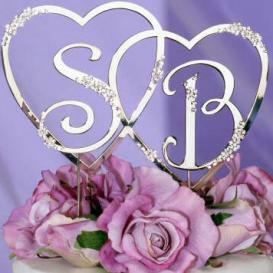 Cake toppers help define your wedding style and add personality to your celebration. The following are some of my favourites. To view all of them visit HerWeddingShop and shop for your cake topper from the convenience of your home. A tall, sleek design makes this an absolutely modern choice for a cake topper. The bride’s dress is painted with a pearly white while the groom’s red bow tie adds a pop of chic color. Each figurine measures 6.5″ tall and is made of lightweight resin. Glazed porcelain provides a delicate, glossy white finish that looks like icing so this cake topper blends seamlessly with the rest of the cake. It’s crafted in a traditional style and is made to be displayed as a keepsake after the wedding. Each topper measures 5.75″ tall. Give your cake a look that’s fresh and trendy with this bejeweled topper bearing your initials and symbolizing that you are now together as one. Each silver metal and Swarovski crystal set comes in three pieces – the linked hearts are one piece, and the initials are two separate pieces. 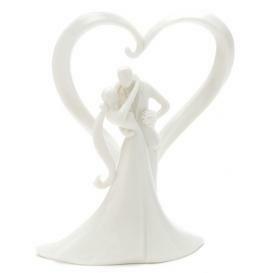 Once grouped together, your cake topper will measure approximately 4″ tall and 7.25″ wide at widest point. Pieces are easily set into the cake with the attached 5″ spikes. Cupcake Wedding Cakes : Love it or Hate it?